« What If Adam and Eve Never Ate the Apple? Why am I getting into this? Why am I so concerned with the “Sinner’s Prayer” today? Well, I’ve recently gotten into two really deep conversations with friends who are not Christians. And they were great conversations. I was able to share the story of Christ, why I think the most important question is not “Does God exist?” but rather “Did Jesus rise from the dead?”, and for me how the implications of Jesus rising from the dead is great news for all people and all creation. We had fantastic back and forth discussion on the authority of Scripture and the history of the church. I think the conversations had been absolutely enlightening for all of us. One person, I will have an on-going relationship with. The other was just passing through town. As these conversations were wrapping up, I couldn’t help feel some of those zealous Christian teenage compulsions rise up in me. And a thought occurred to me in each situation, “Am I supposed to lead them in the ‘Sinner’s Prayer’ now, am I supposed to make them a Christian now?” So here’s the conflict: On the one hand, 1) I entered into these conversations because I love and respect these people and am happy to share life and the good news of Jesus with people. On the other hand, 2) I have been programmed to “seal the deal” by converting people via the “Sinner’s Prayer” and to feel like a failure if I walk away from a conversation unsure whether or not that person really came to faith in Jesus! 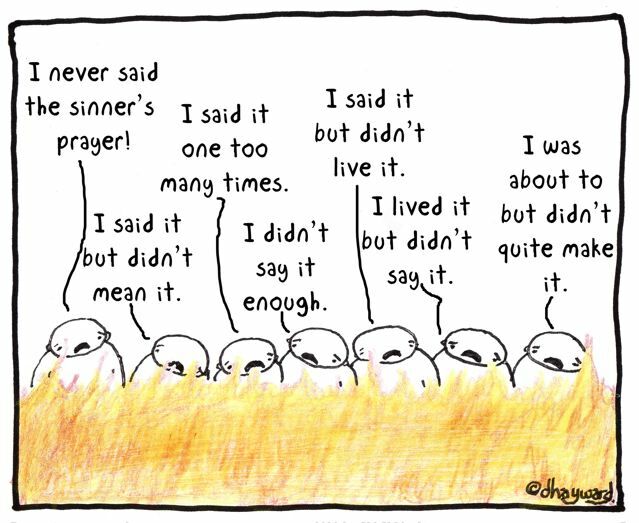 Here’s the thing (and why I ultimately did not lead either of them in the “Sinner’s Prayer”): I don’t really think the “Sinner’s Prayer” seals the deal of salvation. Maybe no one really believes that? The idea that the power of Christ’s death and resurrection completely relies on whether or not a person says a specific prayer seems to really diminish Christ’s ability and desire to redeem the people he loves. Maybe it’s not the prayer, maybe it’s getting a person to believe perfectly or correctly, maybe that’s what ratifies Christ’s work and sacrifice for us? But what does it mean to believe correctly? I just watch a documentary on Youth Ministry that told me I’m failing if I don’t get the teens to believe that the earth is only 6 thousand years old, but I don’t believe the earth is 6 thousand years old. Do I believe incorrectly? And does this incorrect belief cancel Christ’s saving work done for me? I didn’t lead either of them in the “Sinner’s Prayer” because I think that method of evangelism makes Christ’s work for us contingent on our very fickle selves. Ultimately, that says that God’s work in Jesus is weak. No, the “Sinner’s Prayer” does not seal the deal for salvation. The work of the cross did that for all people and it is a free gift. Christ died for us while we were still sinners, independently of us, and on our behalf. It is a free gift. And I am happy to tell anyone that. I will not tell anyone that this gift is ineffective until they do something specific (that is Pelagianism), like say a prayer or believe a certain way. Christ’s work for us is powerful. It’s breaks the power of cancelled sin. It bring the dead to life. It recreates us as new and transformed people. Don’t get me wrong, I believe God honors free will and allows us to reject his gifts, but who would when presented with such grace, love, relevance, and excitement? But, Christ calls us to make disciples, and how do I know that I am answering his call to do so if I don’t lead people in the “Sinner’s Prayer” and keep tally of the people I’ve led to Jesus? The only way that I know how to really join in God’s transformative work and “make disciples” is to invite people into the journey I am on, share with them the good news that God can transform us, that God is making all things right, and that God invites us to join him in making things right in the world. To make disciples is to journey with people through transformation, to invite them into your worship habits, your prayers (including prayers of confession), your conversation, to love them and serve them sacrificially, to be Christ to them. And this type of transformation, this type of evangelism, it takes time. It takes years. It means being there. For one of my conversation partners, I will be there for him… for years, because I believe that Christ will never leave or forsake us, and if I can’t model that for him, how can I expect him to believe what I say? I must be a model of Christ, a Christian for him. Above all, I must trust that Christ will reveal himself to my friend. Lord, use me. When I was 12, someone scared me with threats of hell to say the “Sinner’s Prayer.” For a long time, I used to think that that moment made me a Christian, but I was wrong. I was being made into a Christian long before and long after that moment. From a young age, people in my church told me Jesus loved me, and they modeled that love for me. My parents modeled faithfulness and devotion. As a teenager, people befriended me and joined in my life with me, not with the agenda to change me, but with the agenda to love me and share life. We talked about God from time to time. We prayed for each other, even if we didn’t tell each other. People who loved Jesus dove into my life and never left. They did not coerce me into saying a prayer, but they guided me… for years. And I’m sure it was hard work. It was not the moment when someone persuaded me to say a prayer that made me a Christian. It was the people that loved Jesus and shared in my life, giving up their time (years) to show me what unrelenting love is. That’s why I’m a Christian. That’s probably why you are a Christian. And that’s how we join with Christ in making Christians. Posted on September 27, 2013 by ricshewell. This entry was posted in Christian Culture, Church Leadership, Inspiration, Theology and tagged being there, christianity, conversation, conversion, evangelism, my story, prayer, Sinners Prayer. Bookmark the permalink.